My “Cycling East” cycle touring adventure is now over so it seemed a good time to write a review on the Apidura bike packing bags I have been using everyday for almost 4 months. 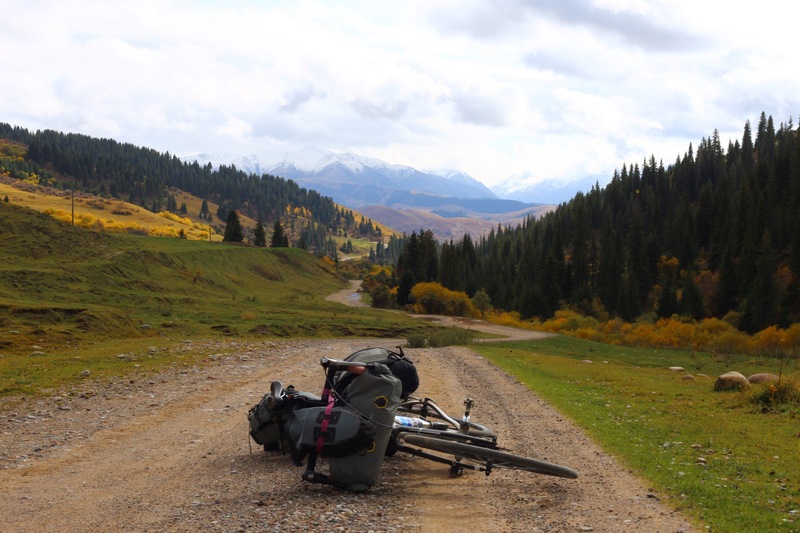 Apidura are a fairly new company whose goal is to make great quality and super stylish ultralight bike-packing bags. Based in the UK but very much global, Apidura have stacks of cycle touring experience among their staff. They’ve certainly all ridden their bikes and given lots of thought into the whole range of bike bags that they make. I used the bar bag, the top tube bags, the large saddle pack and the large frame bag. I was stoked to test their products on my ride to China and then Nepal and India in Summer/Autumn 2014. 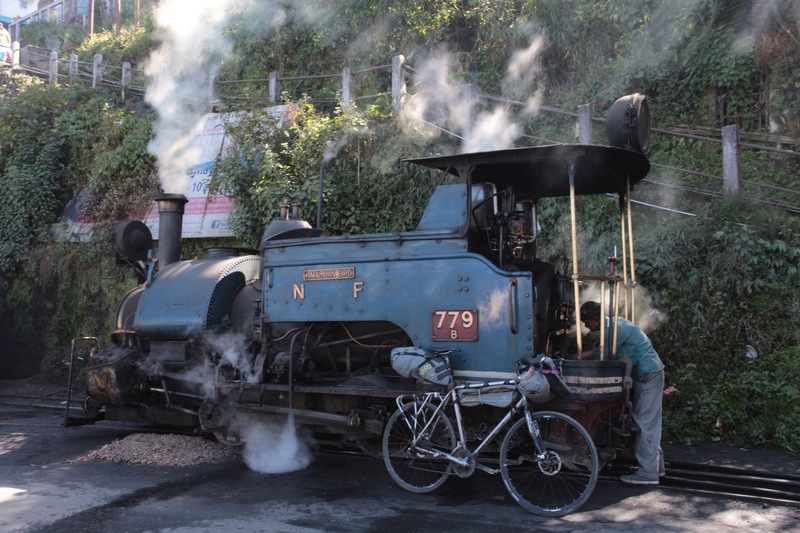 I ended my cycle tour from England by riding a short but steep and very scenic loop from the India/Nepal border to Darjeeling towards the enchanting and ancient land of Sikkim using just the Apidura bike bags. It’s fair to say this entire trip was a thorough test of Apidura’s bags! 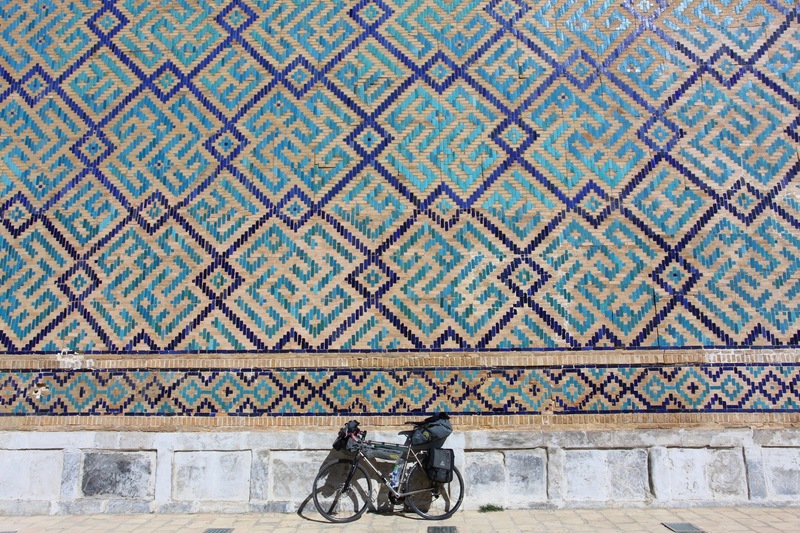 During the trip I used the Apidura bar bag, frame bag and since Tbilisi in Georgia I had been using the Apidura saddle bag. I will explain why later but I stopped using the Apidura frame top tube bags. I didn’t have any need for the clever front accessory pack that smoothly clips onto the front bar bag. Instead I used a specific waterproof DSLR camera bag (from Ortleib) strapped on the front bar bag (rumour has it Apidura might be on the case about making one though). 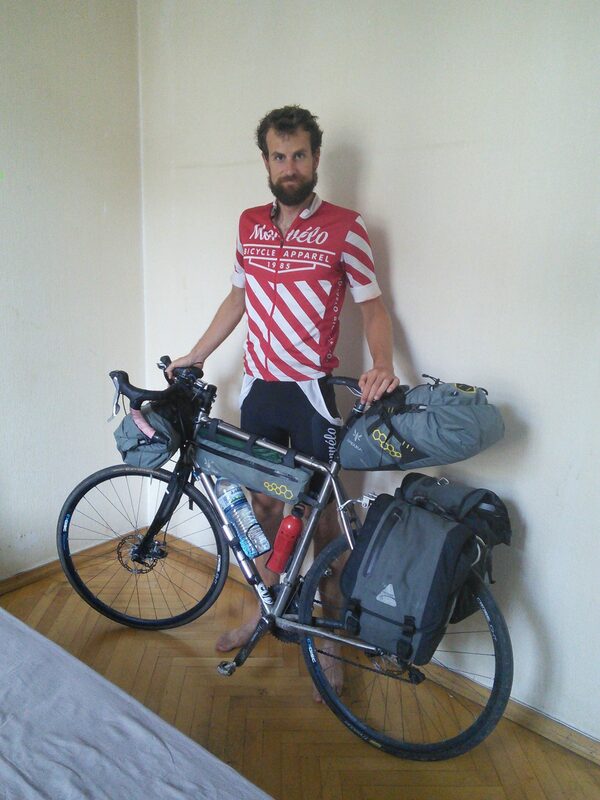 After cycling solo from Georgia I decided to cut down on my kit to go faster. At that point I could have physically fitted all my gear into the three main Apidura bags (frame, saddle and bar bag), however that left no room for food, extra water nor warmer clothes for the mountains, so I kept my lightweight panniers from Axiom but strapped them closed and half empty just in case I needed them! 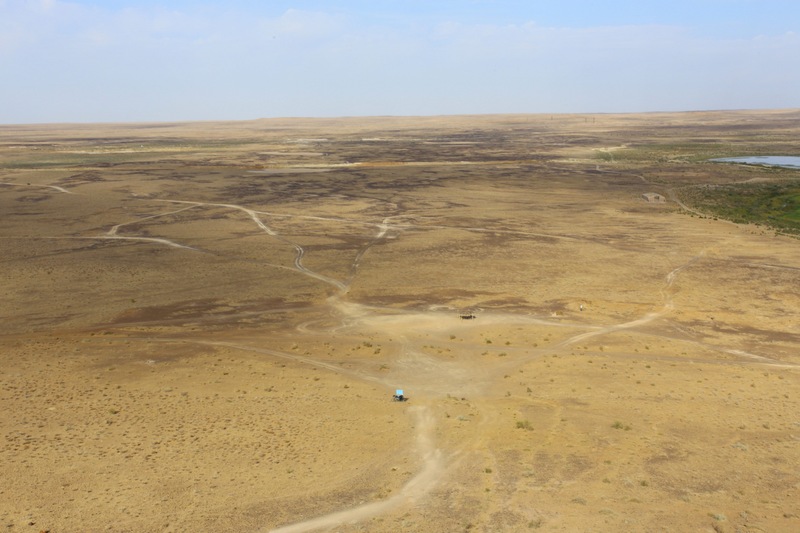 The below photograph in Uzbekistan, near the Turkmenistan border illustrates the remoteness and how the extra pannier capacity came in useful for food and water. The added bonus of this set up is its reliability; if a pannier or rack broke I had no issue squeezing kit in elsewhere. It also spread the kit all over the bike evenly making my Kinesis Tripster ATR handle like it wasn’t loaded. This saves the weight and risk of failure on the rack like they often do on longer trips! The final bonus was how aerodynamic I was without bulky panniers making headwinds a tad easier. Click here for my kit list. I have now used the saddle bag for 6 weeks since picking it up in Georgia and I am pleased to say it has been fantastic. It sits perfectly under the saddle, not too high nor too low. There was not much noticeable wobbling side to side like some packs I’ve used, nor any sagging downwards regardless of how I packed it. It has well placed straps over the seat rails and around the seat post with just enough internal structure to support it. It was super easy to attach and load up. Like the other Apidura bags it was pretty much as lightweight as seems possible for a complete bag rather than just a harness, but as a result of this weight saving it wasn’t totally waterproof. I used the saddle bag for my tent and roll mat which are already bagged and I added some clothes in a dry bag so the ridiculous wet weather I had at times was no issue. 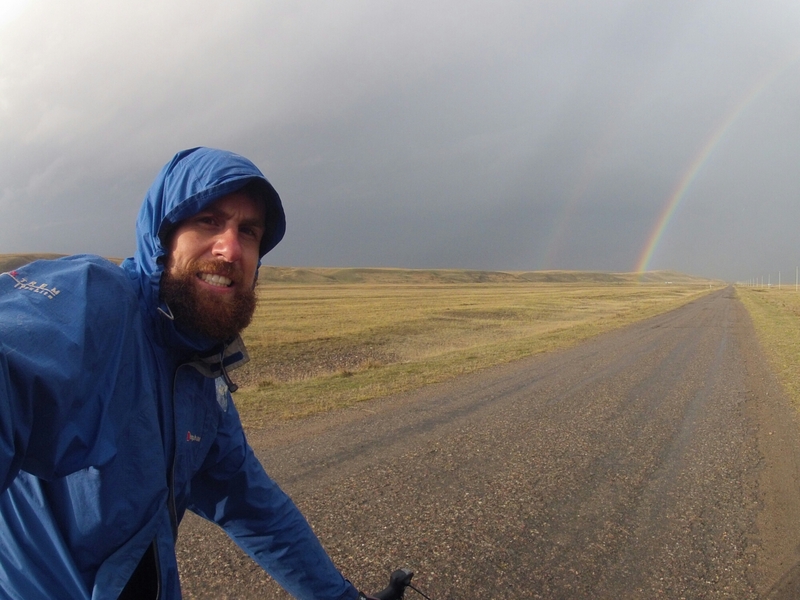 During the trip the weather was not always kind, for quite a few days it rained a lot in Kyrgyzstan, so the bags got a thorough testing like in the rainbow picture below! Next up was the bar bag which does exactly what you might expect i.e hold kit under the bars with minimal fuss. It has a reinforced section on the back where it could rub against the bars and wear out. There are fold down openings on both ends for easy access combined with three straps for quick and secure fitting. I found it sat between but slightly under my standard width drop bars (44cm) and hung best when fully packed so to give it more structure. I have a long head tube on the Tripster allowing the bag to sit well above the tyres, however on small frame sizes wheel clearance might be an issue with it hanging lower. Flared drop bars are the obvious solution to this, letting in hang higher up. I used it for my sleeping bag and cooking kit which worked well. It didn’t get in the way of the brake levers as I feared it might given the 44cm standard bars I used. It hasn’t visibly worn in any way at all, but it does literally have my blood, sweat and tears all over it now! Altogether a very light and well thought out piece of kit. I decided not to use the Apidura front accessory pocket that cleverly clips onto the main Apidura bar bag but instead I used a DSLR specific bag from Ortleib. So I can’t review the accessory pocket beyond saying it looked well thought out and had the same high construction standards as the other bags. It would suit sun glasses waterproofs, food etc very nicely, but remember it’s not totally waterproof nor padded for valuable electronic kit. Click here for my kit list. I started using the frame top bags in both medium and large, these are useful spaces that fit neatly between the top tube and seat post and the top tube and stem. Over time I found they attracted attention looking like perfect pockets for valuable Iphones or cameras, but the main issue for me was that I never really found a purpose that justified having and using them so they were sent home. Overall a neat well thought out design with the same good build quality I just didn’t need them. The frame bag was a great piece of kit, fitting snugly under the top tube, and I used it for all my spare tubes and bike bits as well as tent poles to try and centre my kit weight a bit. It has two pockets and three well placed velcro straps as well as a buckled strap each end to keep it stable. Sadly one zip broke in Kazakhstan after several months use, but this was probably from user error – a result of my overloading it. Without a functioning zip it still served a purpose and I learnt my lesson of not shoving too much gear in! 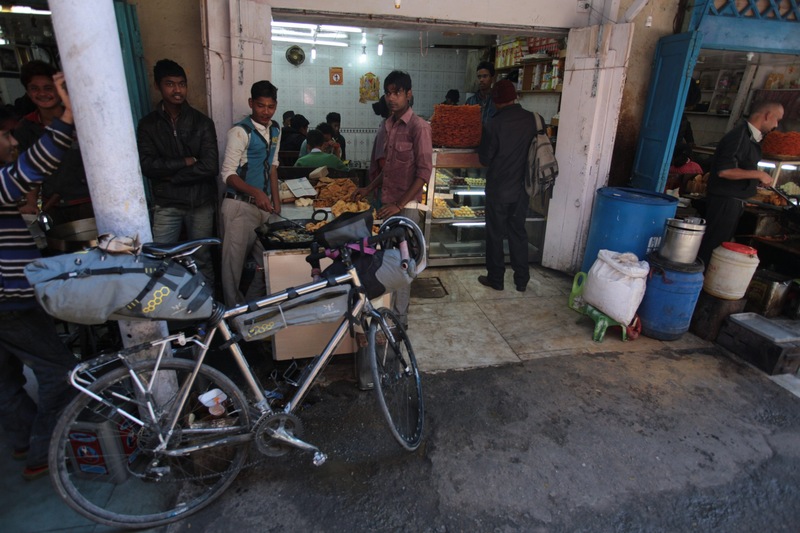 The picture below shows the bike outside an Indian sweet shop near Darjeeling, with the frame pack zip broken and strapped with a zip tie. Anyone who has cycled here in India will tell you that these sweet shops become your new favourite places but may also be the cause of bad stomach problems! Overall the frame bag is a no brainer, just buy one it will always be useful and I still think it should be reliable! I have been very pleased with the bags, there were a few small grievances I explained in my first review, mainly around waterproofing. However I fully accept that they are a minimalist, light weight design and sacrifices must be made for this lower-weight such as waterproof seam sealing. Contrary to many low weight designs these bags have lasted remarkably well, certainly not showing much wear on the seams or on the fabric after 100 days usage. When coupled with dry bags I would highly recommend this set-up for anyone considering a similar trip. Click here for my kit list. On a different more sour note my opinion about the Axiom panniers changed a lot over the trip, both from speaking to others on the road and from my own experience including the seam busting catastrophically, so watch out for a separate blog piece on them! Did you get much frame rub from the bags? That’s one reason I love Titanium because you can’t tell! The frame bag only seems to rub if all straps not tight so can move about, something I’m guilty of hence the Ti is a bit polished but this is after 2.5 years use. I do tape my carbon MTB frame on the strap contact points with electric tape as a precaution, same as I do for frame mounted light battery packs. Off-road the grit and bumps will test the limits so better to be safe. Also beware that the bar bag doesn’t wear but it can move cables about so they might now rub on frame or fork. The bar bag, food pouches and seatpost have certainly never rubbed for me. Thanks for your reply. I don’t have the luxury of titanium so I will take precaution as you have done and use helicopter or electrician tape!